Hero Arts has completely knocked me off my feet with the color layering Bird And Branch set. I’ve seen flowers, many of them, but birds? Seriously how cool is this bird stamp set? Yes, I will admit it took me some time to figure out a few nice color combinations (check out THIS video & Color Chart for more ideas & various color options), but let me tell you – this stamp set is simply amazing. Here are a few options that I liked using Hero Arts ink. My favorite one is probably Soft Pool + Emerald Green + Charcoal. I just love that touch of gray there, and I think this makes up for a great winter color combo too. 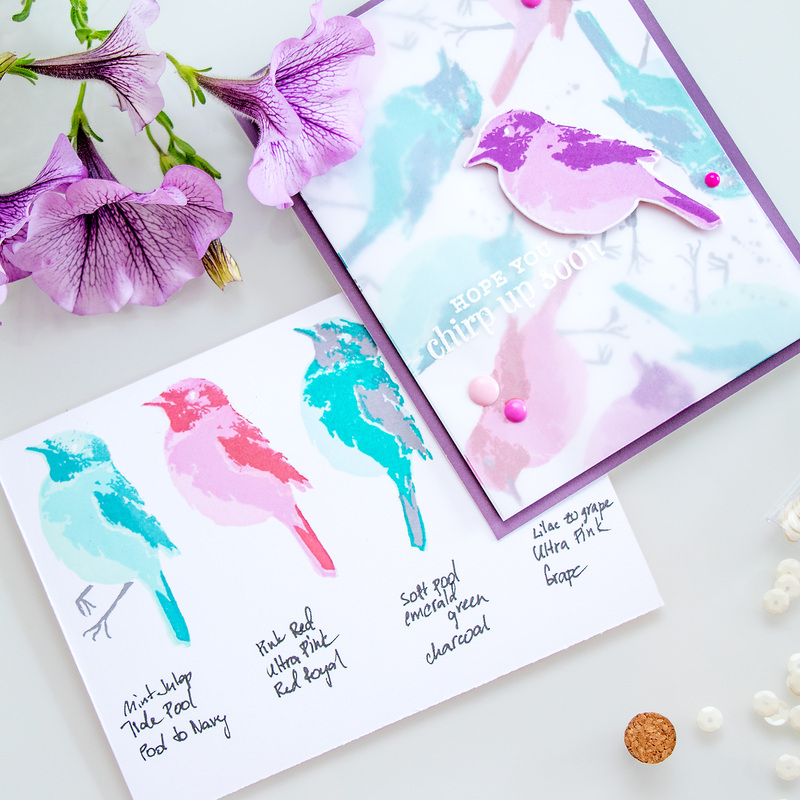 Here’s a closer look at my card – I’ve stamped several birds onto Snow White layering paper from Hero Arts using all of the color combos noted above. I also added a few drops of silver shimmer ink to the background for a more artsy look. 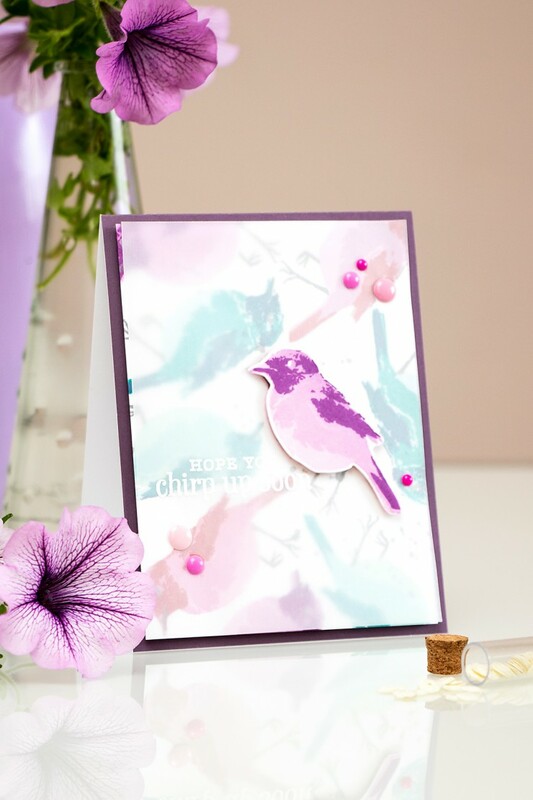 I muted my background using vellum (I just looove this trick) and added one more die cut bird on top (I used Lilac to Grape Ombre pad + Ultra Pink + Grape). For my sentiment I used Hero Arts white embossing powder and Hope You Chirp Up Soon sentiment from the Birdy stamp set. I also added a few enamel dots in various colors and foam mounted my panel onto Hero Arts Floral Mixed Layering paper. 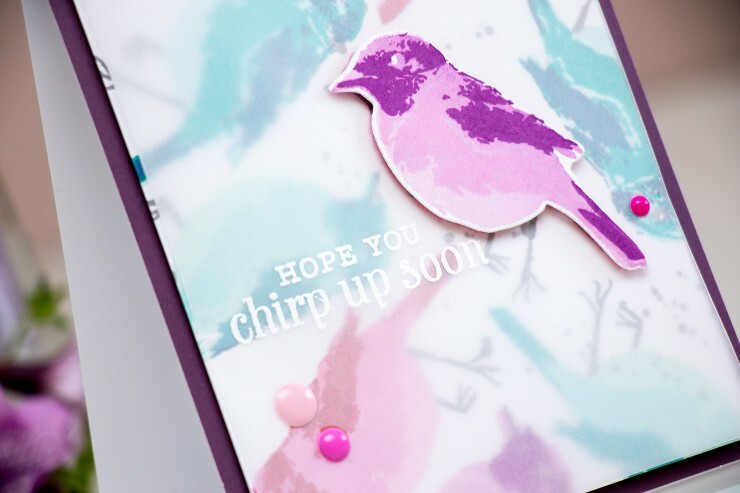 The hope you chirp up soon set of cards is absolutely fabulous. Your colors together have made me want the set. Can hardly wait for any more of your color combos. You have a great eye. Thanks for sharing, beautiful work. thank you so much, Lynn! I appreciate comments like these, they make me want to go and make more cards 🙂 Thanks! thank you so much, Christine! Should be soon, hopefully next week 🙂 thanks! What a fabulous card Yana! Love the color combo! thank you, Celeste! Glad you like it! отличный получился результат, птички потрясающие! Great information on layering colors! This bird makes my credit card cry! I’m not into birds, but cannot resist color layering stamps. The card is stunning! So many colors, love it!